PokerStars Casino Review (2019) - Find Casino BONUS CODES Inside! PokerStars Casino Review - Safe or Rigged? Make sure to read the Casino Professor’s detailed PokerStars Casino review for an in-depth analysis to find out if this site should be next on your hit list. What you’ll find is the latest bonus information – with PokerStars special bonus codes included – free spins, casino games, their VIP program, how fast they payout and more! Crucially, we answer the age-old question of is PokerStars safe to play at. The PokerStars Casino bonus is pretty nice, although there’s one thing that the Professor was puzzled by at first: they’re constantly talking about dollars! Even though PokerStars have separate domains as a UK casino site and an EU casino site, the welcome bonus never refers to GBP or EUR. However, there is the option to deposit in both these currencies, plus Canadian dollars, with a conversion process in place. See the Professor explain the PokerStars Multi-Currency feature below. Although the big headline says up to 2,020 free spins, it states under the terms that the likelihood of receiving 1,000 free spins is 0.01% on both chests. However, you’re guaranteed at least 20 for both deposits, so that’s not too bad in the grand scheme of things. What Are the Free Spins for? Unlike many other welcome free spins, PokerStars Casino are making them available for their Progressive Jackpot Slots – Stars Mega Spin, Matchday Millions, Crystal Millions and Millionaires Island. These games come with a guaranteed jackpot of $1million. As we have said here time and time again, all casino bonuses come with a catch, but the wagering requirements at PokerStars Casino are unlike any that the Professor has ever seen. Basically, you need to earn three so-called redemption points for each dollar you receive as a bonus. A table on their website explains the conversion rates for all types of games that they have (see their slots PDF). The best games for wagering are those with the highest conversion between dollars played and redemption points earned. This is kind of a complex system, so you should really try to make sense of it before playing. All in all, it does seem quite fair, but we cannot say that we really like these kind of weird curveballs. The big question before we actually analyse the casino site and its features: is PokerStars safe to play at? The Professor has seen plenty of negative PokerStars Casino reviews online, so he was particularly cautious when doing his tests. However, he was pleasantly surprised to find very few issues during his stint, with much of the criticism directed at the poker site. Of course, the Prof only dabbles in the casino side of things. Being part of a publically listed company in The Stars Group (TSGI:CN), PokerStars Casino has to stringently adhere to ground rules. They have gaming licenses from many jurisdictions, including the UK Gambling Commission (UKGC) and Malta Gaming Authority (MGA), in order to operate. There are no recorded sanctions on their UKGC license. However, the Professor knows from experience that licenses and reputations don’t guarantee a completely smooth process. 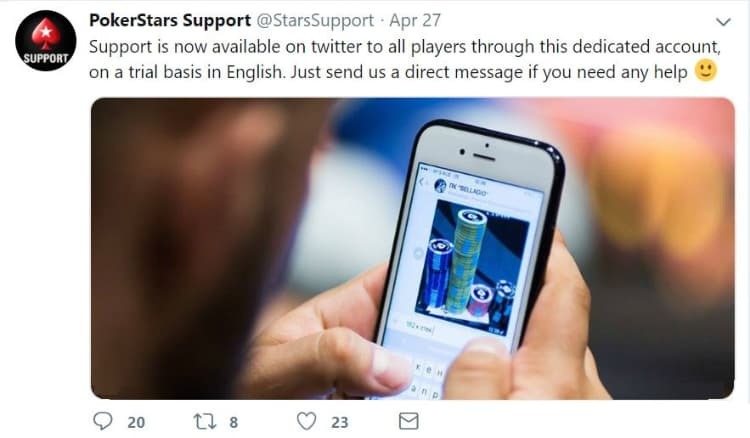 If you have an issue with PokerStars Casino that can’t be resolved with their customer support team, you can raise a dispute with IBAS for a final result. If you’re still on board, PokerStars Casino have a separate Promotions webpage where they offer extra treats to their players. There are plenty of options available which are constantly changing, but here are a few classics that are set in stone. One of the really great perks of playing at a casino with sports betting and poker added is that you can combine your entertainment. However, what if you could combine VIP programs too!? That’s exactly what PokerStars do with their Stars Reward program. Simply fill up your progress bar by making real money wagers and collect chests once you level up. These contain prizes which are tailored to what you like to play. Receive boosts to fill your progress bar more rapidly, and spend so-called StarsCoins in the Rewards store to add to your benefits. Alternatively, you can go head-to-head against fellow players by competing in the many PokerStars tournaments. Take Live Casino leaderboards as an example. No opt-in is needed, and you’ll gain points as you win. The top competitors will walk away at the end of it with a cash prize. Want a more private gaming session? PokerStars Casino run daily slot challenges for you to take part in. Missions such as “play 25 spins on today’s slot of choice” are dreamt up, usually culminating in raffles for bonuses. Brits, therefore, have a good number of choices. Perhaps the icing on the cake, though, is that this is a casino with PayPal deposit option for ease of use. When going to make a withdrawal, you can use either Visa card, MuchBetter, PayPal, Neteller, Skrill, or bank transfer. PokerStars Casino UK withdrawals take usually within 3-5 business days for new players. NOTE: withdrawals are automatically credited back to the method(s) you used to deposit (unless it’s not available). Although you will initially see all bonuses in dollars, you can add a secondary currency from within Cashier in your account if you’d prefer. Select between GBP, EUR or CAD and state which one is your preferred choice. PokerStars Casino will then attempt to use this money first, before converting to USD if needs be. 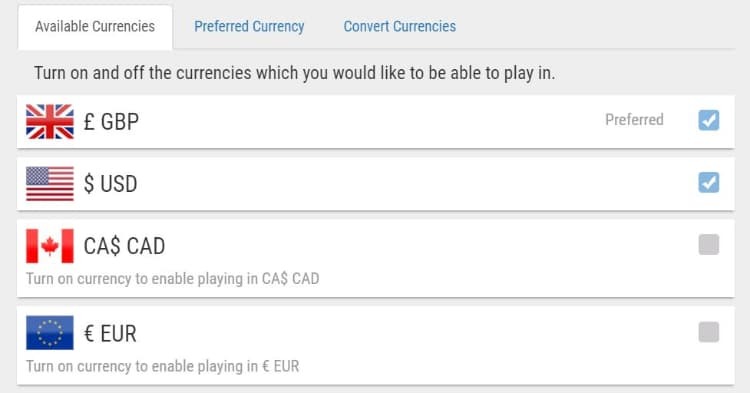 If you don’t add a secondary currency, your deposits will automatically be converted into USD. Don’t worry, you’ll be told exactly how much you’ll get! It sounds a little complicated but you’ll soon get your head around it. When the casino of PokerStars first began, it was limited to just a few slots and providers. These days, there’s a real army of developers on board – with hundreds of games to play! You can see the complete list of PokerStars Casino game providers at the top of this review, but big names such as NetEnt, Microgaming, Playtech, and Quickspin and can be found. If you like live-streaming action, there are a number of live casino tables for you to connect to, featuring roulette, blackjack, baccarat and variations of poker. Although the Professor doesn’t have much of a poker-face, nor is he a keen sports follower – he felt his PokerStars Casino review wouldn’t be the full package without mentioning the other gambling sites on offer. The poker site is one of the most popular of its kind across the globe, with huge poker names being ambassadors. Sports betting falls under the BetStars moniker and includes both your classic and unorthodox games. 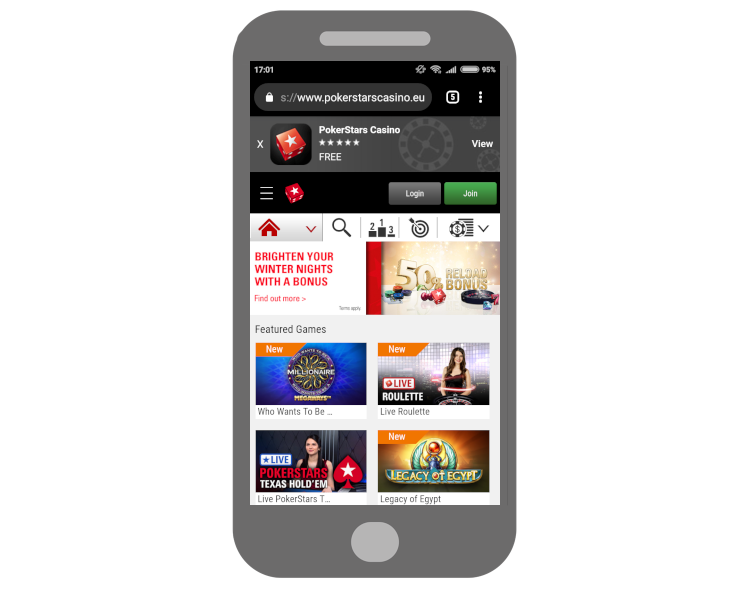 With over 15 years of experience, it shouldn’t come as any surprise that PokerStars Casino is available on mobile devices. You’ll find all of the above features – such as a vast number of games, Stars Rewards, promotions and payment methods – all within your smaller screens. Any up to date smartphone or tablet with a good web browser can be used to log in and play casino or bet on sports. However, UK players on the hunt for a native experience can download the PokerStars Casino app on both Apple and Android. Unlike other sites, the app is heavily promoted with prompts. Yet, the Professor found no real advantage of using the app over the web – for casino at least. Poker players do require a separate app to be downloaded. But for slots, table games and the like, the Prof thinks Chrome, Safari or another reputable browser will do the trick. Online 24 hours a day, 7 days a week, the help team at PokerStars Casino are always on hand to settle any issues. If you think your problem will be common, the first point of call would be the FAQs section – which is particularly detailed! That last entry isn’t just the usual Twitter account either. The @StarsSupport has been set up specifically to help players. Unfortunately, there is no contact number at PokerStars at the moment. Although the site is one of the most comprehensive in the world, there is inevitably still a few places where residents cannot access the entertainment. Regions where online gambling is illegal are not eligible for starters, but the Professor couldn’t find a definitive list of PokerStars prohibited jurisdictions. Try signing up if you’re interested and you should find out pretty quickly. Phew! There was a lot to get through, but the Professor really liked the casino version of PokerStars despite being unsure to begin with. The games library is big, there are a lot of promotions/a good VIP scheme to keep you busy, and it’s all available via mobile. The main blot the Prof didn’t like was the wagering requirements – but that’s mainly because it’s different to the norm, not necessarilly worse or unfair! If you enjoy casino with other gambling then this could well be a great platform for you. Remember to write your own PokerStars review below! I’ve been reading a lot about Pokerstars being a scam site but from the casino I’ve had nothing but good times. Don’t really play poker so I wasn’t sure if Pokerstars was for me but the game library is decent and they have a lot of free spins aswell. Weird wagering that took me a while to get my head round but managed to score a few wins on the live casino. Doesn’t really apply to me as I like casino only but if you’re a fan of poker too then the vip program is good. Counts every bet you make across the site and gives you points and other stuff. Thanks for the PokerStars review, noscamsforme! It’s a bit tricky for us too, as we’re only focussed on casino so can’t comment on poker, sports etc which is where a lot of the criticism comes from. Aside from the odd wagering and occasionally slow support staff, PokerStars Casino has been pretty good. More games could obviously be added, but they’ve come a long way considering poker is their bread and butter. We hope you’ve managed a few wins while playing. Good luck!